SOUTHWEST ASIA (July 23, 2004) -- Airmen at one forward deployed location — engaged daily in a routine of work, chow and picking up laundry — may not think to look up in the sky. But if they did look up, they would see something looking right back at them. Flying at about 300 feet above the ground is a small foam aircraft with a built in video camera. But the plane isn’t there to spy on Airmen as they go about their efforts to support the war on terrorism. Instead, it’s on its way to the perimeter of the installation, where it will fly about looking for suspicious activity. The craft serves as an eye in the sky for the force protection personnel deployed here; it’s another layer of security, a deterrent — it is the Desert Hawk. Senior Airman Alexander Jimenez, 379th Security Force Squadron Force Protection Airborne Surveillance System program, makes adjustments to the antenna that controls the Desert Hawk unmanned aerial vehicle. The Desert Hawk is a small foam aircraft with a built in video camera that is used by security forces personnel to monitor the perimeter of an installation. Airman Jimenez is deployed from Spangdahlem Air Base, Germany. Physically, the Desert Hawk is not a big aircraft. It has a wingspan of about 52 inches, is less than three feet long and weighs around seven pounds. Its mission is pretty big, though. Essentially, the Desert Hawk is keeping an eye out for bad guys with access to MANPADS. MANPADS are fairly easy-to-obtain, shoulder-launched weapon systems that have the capability to destroy or damage U.S. and Coalition aircraft. Should the Desert Hawk see such a threat, local security forces respond with the right level of force. “If the Desert Hawk does happen to fly over something, we can spot it at that moment and then dispatch Guardian units out to assess the situation,” Sergeant Liberti said. The FPASS program is run entirely by enlisted Airmen. Maintenance on the craft, launch and recovery efforts and even piloting of the bird are handled by specially trained volunteers from the Security Forces career field. While FPASS program team members are still regular security forces, their program is a departure from the normal flight duties, said Staff Sgt. Nancy Gonzalez, FPASS program lead. Sergeant Gonzalez has about 17 Desert Hawk flights under her belt. She said her favorite part of the job is putting the plane in the air. According to Sergeant Gonzalez, it takes two Airmen to launch the Desert Hawk — a pilot and a copilot. The pilot holds the aircraft about five feet off the ground. The copilot attaches the end of a bungee cord to plane and then walks away, stretching the cord tight and charging it with just the right amount of potential energy to launch the tiny plane into the air. The copilot wears a vest and helmet just in case the plane should launch into his chest instead of climb skyward. The plane doesn’t start out with the engine running, however. That doesn’t happen until after it’s shot into the air. The plane’s battery power and tiny propeller can keep the craft in the air for approximately 60 minutes, she said. Staff Sgt. 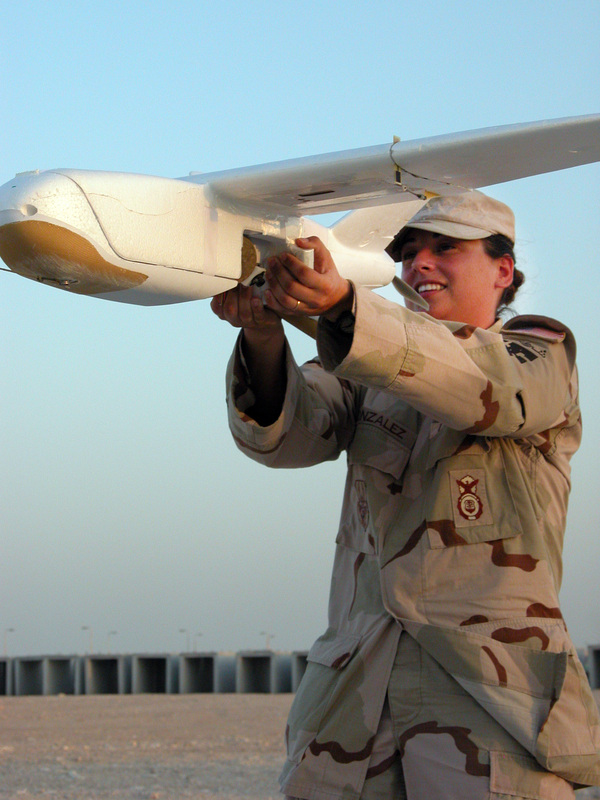 Nancy Gonzalez, noncommissioned officer in charge of the 379th Security Force Squadron's Force Protection Airborne Surveillance System program at one forward deployed location, prepares to launch the Desert Hawk unmanned aerial vehicle. The Desert Hawk is a small foam aircraft with a built in video camera that is used by security forces personnel to monitor the perimeter of an installation. The Desert Hawk operators slingshot the craft into the air with a 50 foot bungee cord. Sergeant Gonzalez is deployed from Spangdahlem Air Base, Germany. The main body of the Desert Hawk is made of high-density foam and costs about 300 dollars. If it needs repair to its frame, it’s Sergeant Gonzalez or members of her team that do the repair. The team doesn’t do repairs to the mechanics of the plane, however. It’s the inner workings of the plane — the cameras, computers, servo motors and mechanical parts — that bring the cost to about $30,000 dollars. Sergeant Gonzalez said problems with the inner workings of the craft are repaired by the manufacturer. The Desert Hawk sees a lot in the sky both day and night. In fact, there are two models of the plane. The first is equipped with a small digital camera that looks similar to what computer users may have on top of their monitor. The camera transmits images via radio wave back to the ground control station. There, Sergeant Gonzalez and her copilot can watch the images on a small video screen and record them to video tape. Another Desert Hawk model is equipped with an infrared camera. Like a Security Forces Airman with a set of night vision goggles, the nighttime Desert Hawk can see in the dark. “The plane provides real-time footage, day or night, of the exterior of the base,” Sergeant Gonzalez said. The Desert Hawk has many of the same features as a larger aircraft. It has wings and flaps. It’s got a tail, a motor and a propeller. What it doesn’t have is a “stick” in the cockpit. Of course, on a plane this small there is no cockpit either. Control of the aircraft comes from a portable ground control station. Instead of flying with manual inputs by a pilot, the Desert Hawk flies a predetermined route programmed in to its onboard control system with the aid of a laptop computer. “You program a flight into the computer, indicating where you want it to go,” Sergeant Gonzalez said. 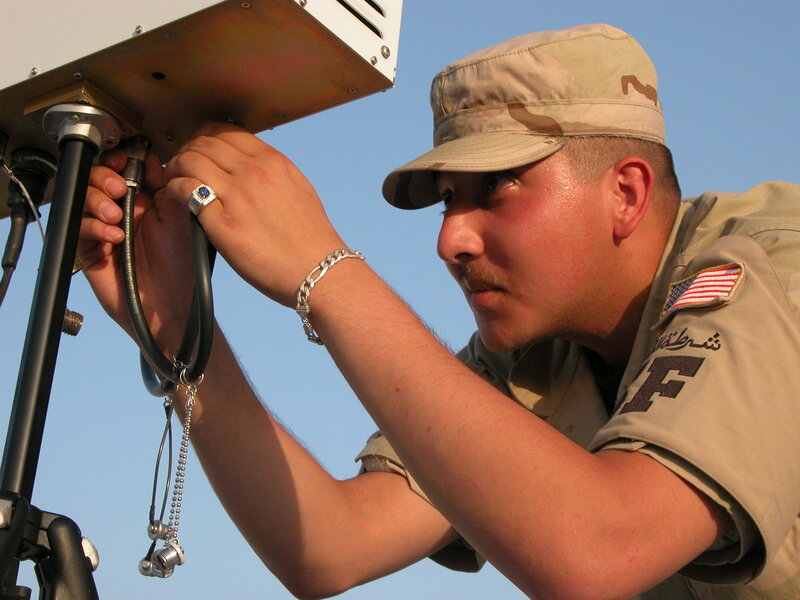 Using an onboard global positioning system receiver, the Desert Hawk is able to keep itself on the course Sergeant Gonzalez programmed it to fly. That means that the operator on the ground isn’t really telling the craft where to go once it’s in the air. But that doesn’t mean she couldn’t reprogram it in mid-flight. In fact, being able to do so is critical to the Desert Hawk mission. Landing the Desert Hawk is a bit different than landing a regular airplane, because it has no wheels. Instead of coming in for a traditional landing, it comes in for what amounts to a controlled crash. Sergeant Gonzalez must ensure the wind, terrain and angle of descent are all correct and may have to do several passes before the plane can be brought home safely. Still, should the craft come down hard, it is pretty tough. The Desert Hawk is not as expensive, or as sophisticated as its bigger siblings, the Global Hawk or the Predator. It can’t fly as far and it can’t deliver munitions. But its mission is as important to ground based security forces in deployed locations as the bigger craft are to the Air Force as a whole.